Brand New Mask from ResMed. In stock and shipping now! Sleep the way you want with ResMed AirFit ™N30i. Featuring a top-of-the-head tube design and a nasal cradle cushion that sits comfortably under the nose, you can sleep in any position, including your side or stomach. No front-end tube alsomeans the mask stays out of sight and out of the way, so you can sleep closer to your bed partner. 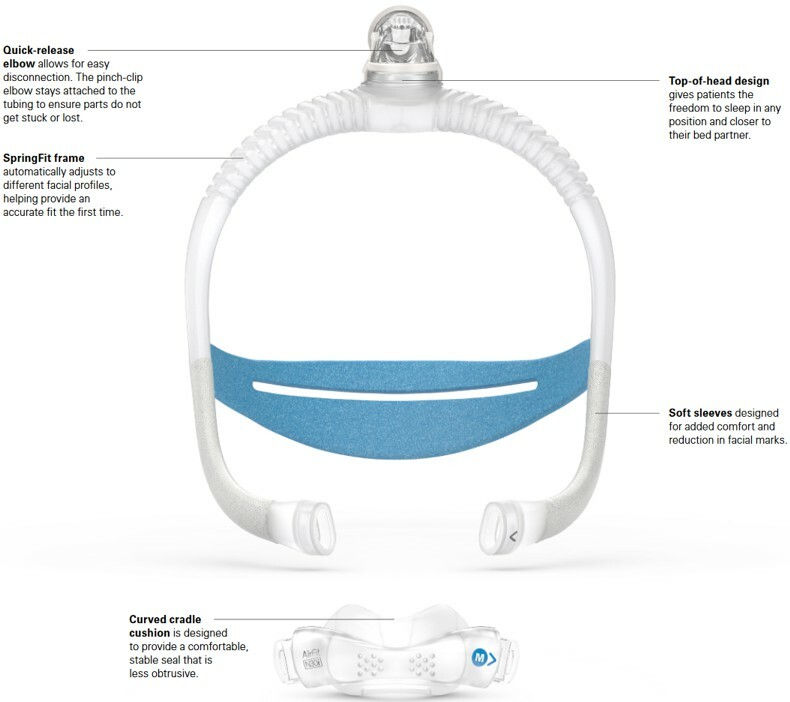 The SpringFit frame adapts for a personalized fit and features a quick-release elbow that makes it easy to disconnect mask from tubing if you need to get up at night. Four cushion sizes available to ensure a good seal. Fit packs come with small, medium and small-wide cushions. A wide cushion is available separately. Quick-release elbow makes it easy to disconnect the mask from tubing if you need to get up at night. Call us at 1-888-955-2727 with questions or to place an order. Note that the starter packs include one frame size, and three cradle cushion sizes: small, medium, and medium-wide. The only other cushion size available separately is size wide. One of the small, medium or medium-wide cushions will fit a vast majority of faces, but if you find you need the wide size you can order separately. Also, we can customize a fit pack for you, so feel free to call us at 1-888-955-2727. Got the new mask and it’s the best ever. The hose entrance and swivel on top of the head allows rolling over both ways without getting tangled in the hose. The nose pillows will not seal properly for me. The headgear is very comfortable and I really like the air delivery tube being attached to the top of the headgear. This mask is not for mobile sleepers, if you roll on your side it leakes, roll to your back it leakes, I spend the better part of the night adjusting the head gear.If you sleep only on your back, this is the mask for you. The mask was ordered for my wife and she like the mask. This is probably the best nasal mask I've ever had. It's comfortable, doesn't leave marks on my face, and I love having the tube at the top of my head instead of hanging at my nose. I was somewhat surprised that it came with only one size of cushions (medium): the description implies it comes with several sizes and mine only came with a medium size. The medium size works for me but I wonder why there was only one cushion provided.